At National RV Detroit, we've been selling at the top brand RVs at wholesale prices since 2008! 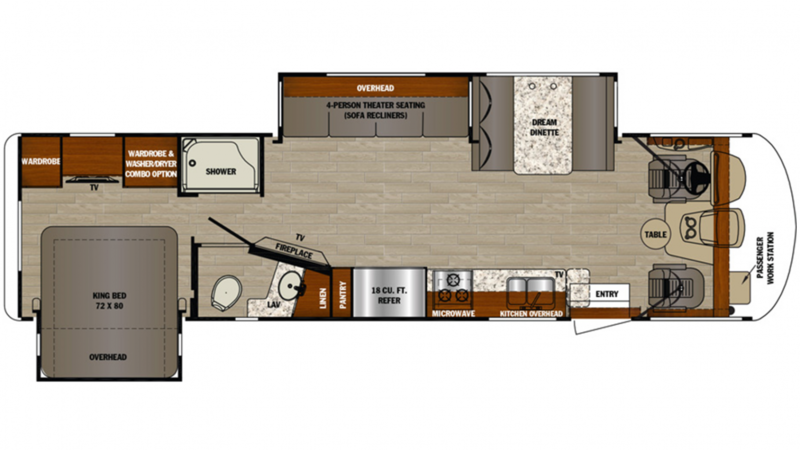 So if you have your eye on the 2019 Forest River Georgetown 5 Series 31L Gas Class A Motorhome come and see us! We're located in lovely Belleville, Michigan and we carry the largest inventory of the nation's most popular 5th wheels, travel trailers, motorhomes, toy haulers, and more! Stop by our store at 44700 N I 94 Service Dr Belleville Michigan 48111 and talk to one of our friendly, knowledgeable staff! You'll save $1000s on this great Georgetown 5 Series 31L. Don't live in the Belleville area? No worries! With our personalized phone and internet service, and 24/7 fast delivery across North America, you can call us at 734-439-3400 and this great Class A Motorhome will be at your door in no time! With its GVWR of 20500 lbs. and hitch weight of 5000 lbs, this RV can travel across the country without any issues! For some much-needed shade, pull out the 19' 0" awning with ease! At 34' 11" long, and 8' 4" wide, with 2 slides, there's great living space inside! Families as large as 5 members will enjoy great sleeping accommodations. You'll especially love the comfort of the King bed in the master bedroom! Remember those days when you had to eat out so often on the road? How expensive it was, and how tasteless all the fast food became? Those days are gone when you travel in the Forest River Georgetown 5 Series 31L! It features a kitchen area that includes a full complement of modern cooking appliances. You can store all your favorite meats, veggies, and cold drinks in the 18.00 cu. ft. refrigerator, and then cook up great hot breakfasts, lunches, and dinners on the convenient 3 burner range cooktop! You'll be able to clean, drink, and cook with plenty of water from the 82 gallon freshwater tank! Do you dread that morning trek through the campground to the cold, damp, crowded public restrooms? Here's the great news! 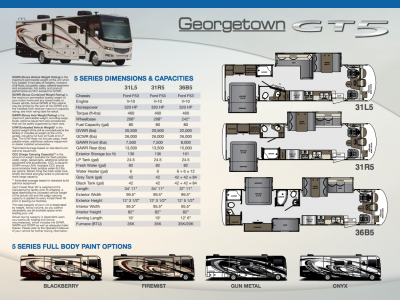 The Georgetown 5 Series 31L has its own full bathroom, complete with shower, sink vanity, and Plastic Foot Flush toilet. You'll enjoy all the comfort, convenience, and privacy of home!